The best Artificial Intelligence and Machine Learning news including Automation, Robotics, AI in business, and Data Science straight to you inbox. WASHINGTON (Reuters) - The White House plans to convene a meeting on Thursday on the future of artificial intelligence in U.S. industry with major companies including Facebook Inc, Amazon.com Inc, Google parent Alphabet Inc and Oracle Corp as well as senior government officials. Most modern AI requires massive amounts of data to train a machine to more accurately predict the future. A Google program can pass as a human on the phone. Should it be required to tell people it’s a machine? Google's unveiling on Tuesday of Duplex — an automated voice assistant that can book restaurant reservations, check opening hours and accomplish other tasks over the phone — has thrown a spotlight on how advanced AI can now carry on conversations that are so lifelike that even a human listener can be fooled. A 1970’s TV character, half woman half robot, was another role model for Dr. Howard. 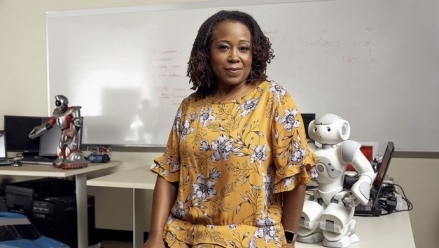 She was 27 years old when she took charge of the NASA team developing artificial intelligence for Mars rovers. Essentials gives you key insights about your market, industry, competitors with the most relevant news from trusted and respected industry leaders. We only extract articles from quality sources and leaders in disruption, automation, the future of work and blockchain. It's like having your own personal team of experts pick out the best news and send it to you weekly. You won't need any other news so you can cancel your other subscriptions and get rid of your clogged-up inbox. Thanks to its social media filtering AI it helps focus on the news, and the people that matter.